This entry was posted on October 6, 2014, in HR. Bookmark the permalink. Pink is everywhere! October is Breast Cancer Awareness Month and several of Coliseum’s staff, physicians, and breast cancer survivors have been featured in stories to kick the month off right in a continued campaign to build awareness. On October 1, The Telegraph ran a story on the front page featuring several of Coliseum’s star staff and physicians – all who have been crucial players to the survivor’s story path to regaining her health. You can read the story by clicking here. Additionally, on October 1, the Coliseum Cancer Institute held a celebration for the Bosom Buddies breast cancer survivor group and honored each of the survivors with delicious a delicious lunch and give-aways. Both News Central Georgia (FOX 24) and 41 NBC were able to share stories of some Bosom Buddy survivors. To see one story from 41 NBC, click here. The Coliseum Cancer Institute is involved with many more breast cancer awareness events throughout the month, the events are listed below or can also be accessed from the CHS website’s homepage. Coliseum Cancer Center | 2:00 p.m. – 4:00 p.m. 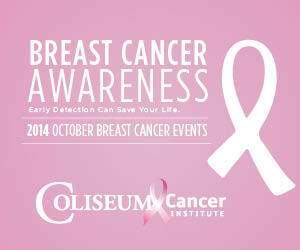 Coliseum Cancer Center | 2:00 p.m. – 3:00 p.m.
with Guest Speakers Keith Martin, M.D. & Paul Syribeys, M.D. Trinity United Methodist Church | 6:30 p.m. Coliseum Women’s Center | 4:00 p.m. – 7:00 p.m.
North Peach Park, Byron, GA | 7:00 a.m. – 11:00 a.m. Coliseum Cancer Center | 6:00 p.m. – 7:30 p.m.